Offshore platforms are designed to perform exploration, production at offshore oil fields. An offshore platform structurally can be divided into two parts: the topsides and the substructure. The topsides is a steel structure providing spaces to hold various kinds of facilities for exploration/production and human activities. Substructures are necessary to support the topsides “sitting” at an elevation safely above the ocean free surface. In general, the topsides and the substructure of a platform are designed and fabricated separately. The completed topsides and the substructure are then integrated at inshore or offshore site. Integration methodology depends on the topsides and substructure design, at the same time, the selected integration method has strong impacts on the platform design, especially the design of the topsides. 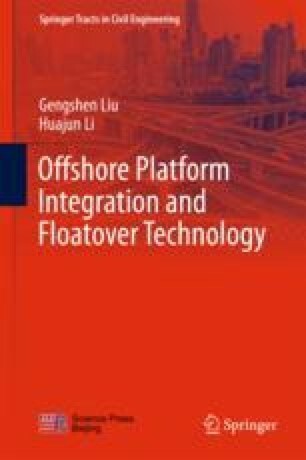 Discussion in this chapter starts from platform topsides and covers the various kind of topsides design philosophies. Through examples, it is shown that platform design is strongly related to the platform integration methodology, changing integration method at the later stage of platform design will impact the project in the negative way in general.